US 6 enters Utah while multiplexed with I-70. When I took these pictures US 6 was still on its own alignment parallel to I-70. At this time US 6 and US 191 went through Green River while US 50 stayed on the I-70 alignment. US 6 in Emery County heading north from I-70. An unusually wet day in the desert. US 6 in Utah County. US 6 meets US 89. 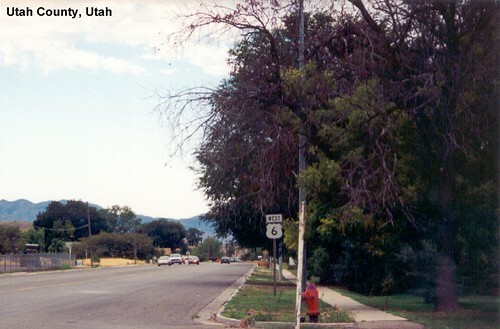 US 6 as a city street in Santaquin. Heading south again toward US 50, I was struck by the desolation on this part of US 6. Stopping for a drink in a very small town I thought to myself I couldn't imagine living in a place with so few other people. In Millard County US 6 is once again multiplexed with US 50. A long straight road in Millard County. We pass a large dry lake that from a distance looks like it has water in it. Another look down US 6 as it heads into a long flat valley.